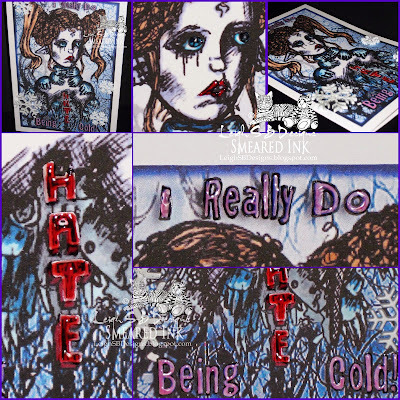 Velvet Paw Creations: "I Really Do Hate Being Cold" a Winter card for Smeared Ink DT! "I Really Do Hate Being Cold" a Winter card for Smeared Ink DT! Smeared Ink released a new image called "It Could Be" last week that I could not resist playing with! 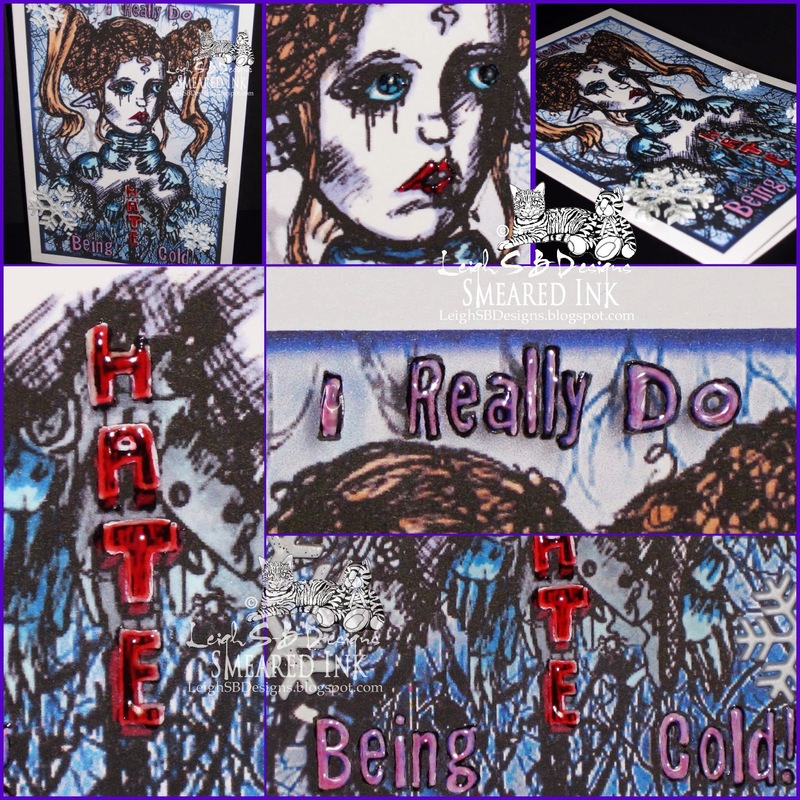 Cold weather and snow and I just do not go well together, LOL, and I knew I wanted to convey my feelings on the subject with this creation especially when I saw the word HATE was incorporated into the design! Doesn't it look like she's been strangled by freezing cold hands...brrrrr! I started out by working with the image in Photoshop CS6 and used one of Smeared Ink's "Honour the Dead" digi papers for the background. I added the text and the frame and printed it out onto heavy weight cardstock suitable for Copic markers then trimmed the cardstock and made a folded card. I coloured the image with Copics, outlined the text with a black Copic Multiliner and used a white gel pen to make the words pop a bit more before applying Judikins Diamond Glaze to the text, her eyes and lips. To make it even more frosty I embellished the card with snowflake buttons. Happy Holidays Everyone, stay warm and safe! This card is amazing! Such a frosty, cold look to it, and then the lettering really pops out! It really matches perfectly with the style of the deco paper, well done!